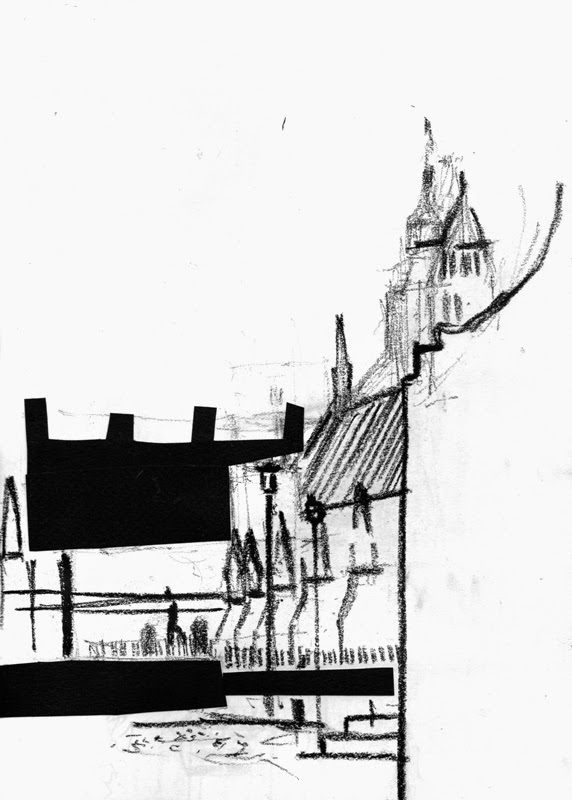 I am now home from my recent jaunt back to my native city, armed with a massive pile of sketches to scan. 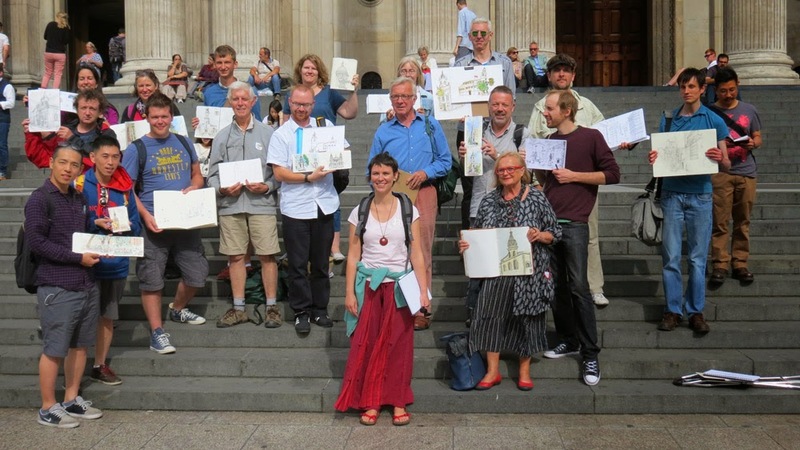 One of the highlights of my trip was meeting many other sketchers on the Sketching Wren's City sketchcrawl...it seems so long ago now, but what an amazing day of exploration! I'll post my results very soon. 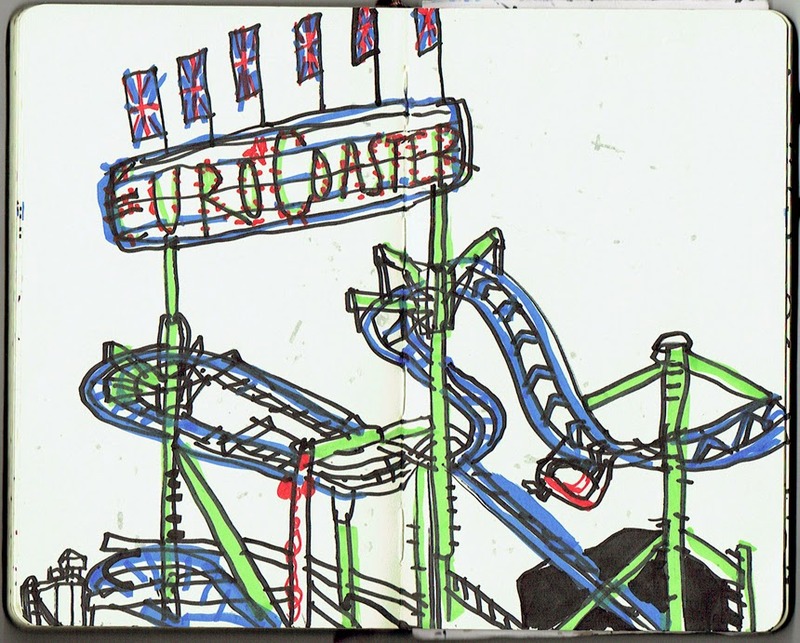 For now, I will post this sketch of a well-known London tourist attraction. I am officially a tourist now, and I love it. 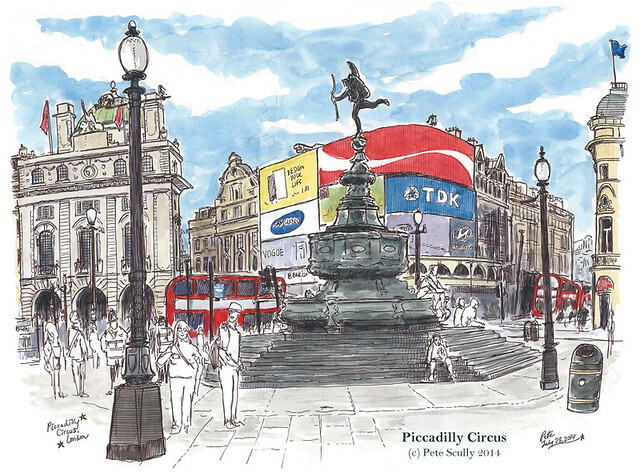 On my first morning back, still dizzy with the transatlantic jetlag, the promise of sketching on the streets of London again proved too much for a morning cup of tea to satiate, so I took an early train down to what is usually one of my least favourite parts of the city: Piccadilly Circus, least loved because it is usually jam-packed with people and traffic and noise and nonsense. However, in the earlier pre-9am hours it is a calmer more respectable place, and I was waiting for Lillywhites to open anyway so I sat outside that large sports store and sketched the Shaftesbury Memorial Fountain, also known as the Angel of Christian Charity, but known to Londoners and signposts alike as 'Eros'. 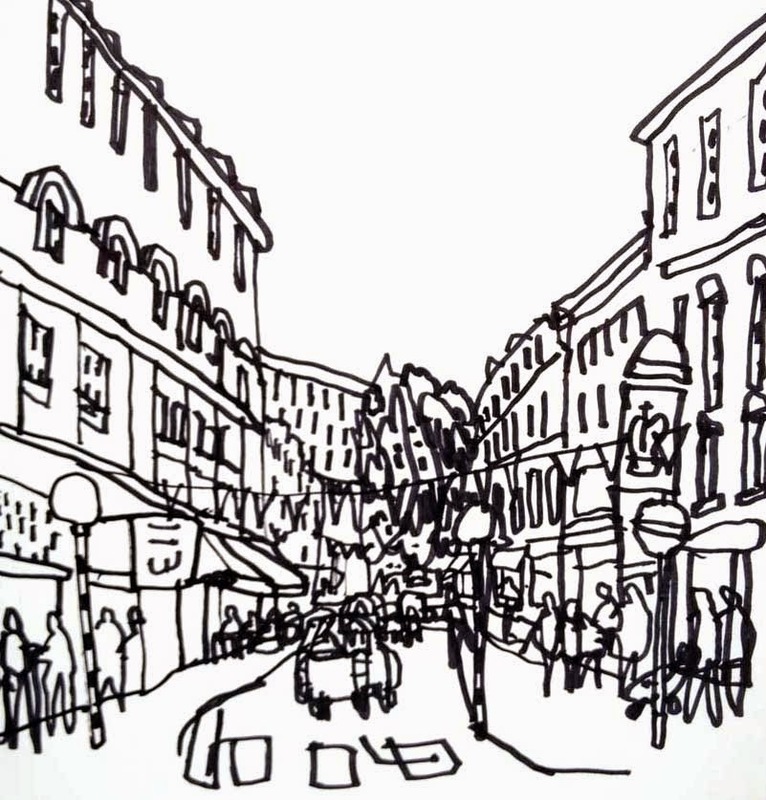 I sketched in a large spiral-bound Stillman and Birn Alpha book, and stood looking towards Regent St and Shaftesbury Avenue. After a while, some police officers showed up, dressed in bright yellow overcoats. They were just hanging around, and then more came. Some photographers also started gathering, and then more police, and then two officers mounted on horseback, all in a jovial mood, all happy to pose with tourists. There must have been over forty police officers there, apparently there to launch a new initiative, and they all stood together and said “cheese, guv” and had their photo taken in front of the statue (“Ello, ello, ello, what’s goin’ on Eros then?”). 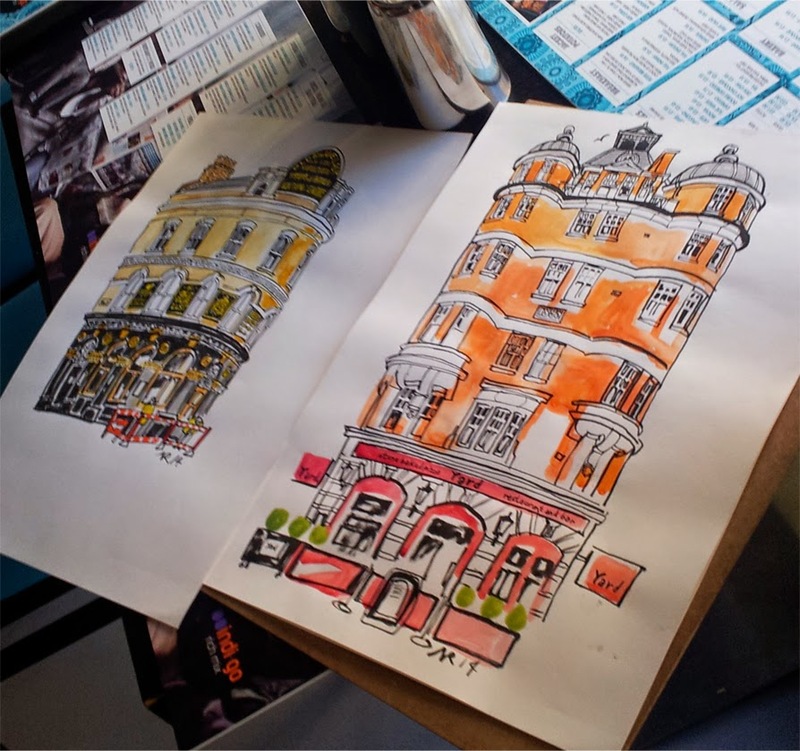 A young woman from Germany, holidaying in London, stopped and watched me sketch for a while, sitting down when I crouched over to add the paint, and told me how she also liked to draw. 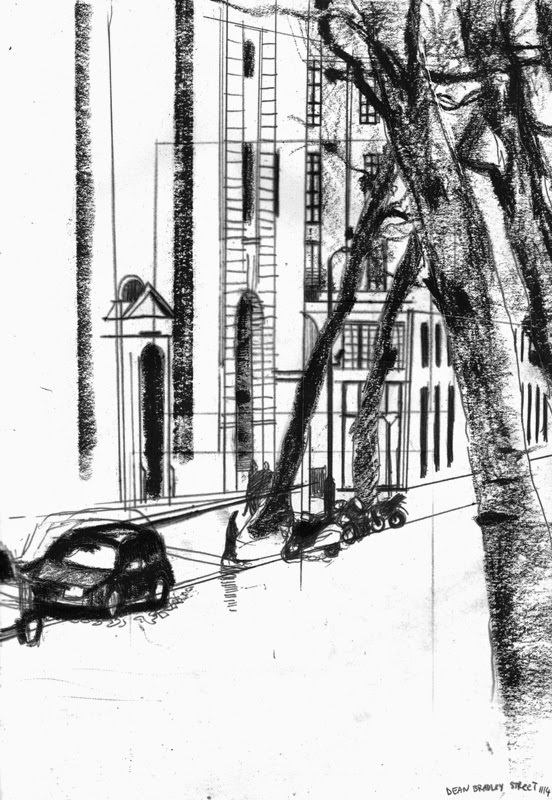 I was in a good mood for my first out-and-about sketch in London, and when I was done I said goodbye to the circus, popped into Lillywhites to look at all the new football shirts, and set off to sketch the narrow dusty streets of Soho. It was good to be back. "In a street where you live"
Well, almost. I thought I'd go local again, with my first love, the 0.5 HB clutch. I remember listening to Ken Howard a while ago saying, "You don't have to go to Venice." Yes I know he did, and he has a studio there but mine is my living room, in South Woodford. 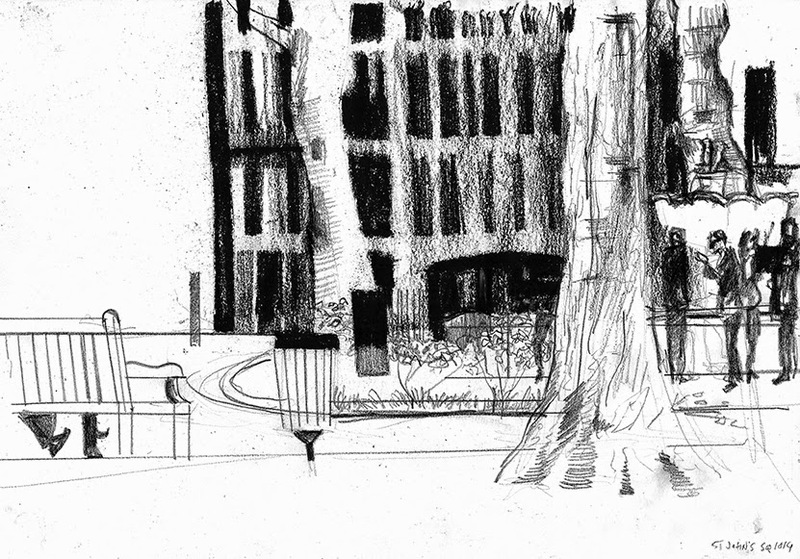 Sketching Wren's London - what next? 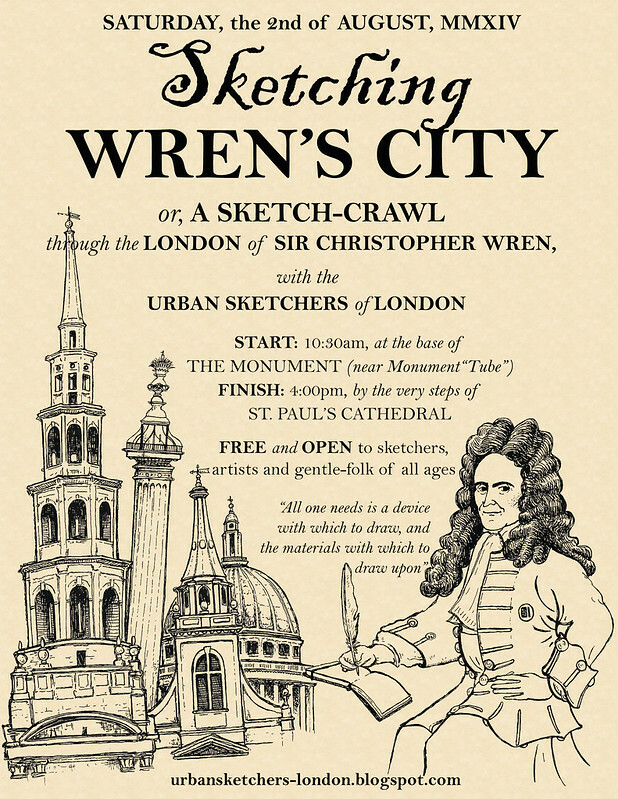 We'd like to try and find out and map how many of Wren's churches we managed to sketch so please be sure to state clearly which church it is on each image. We'll be posting a selection of the images of different churches to the blog in the coming days. 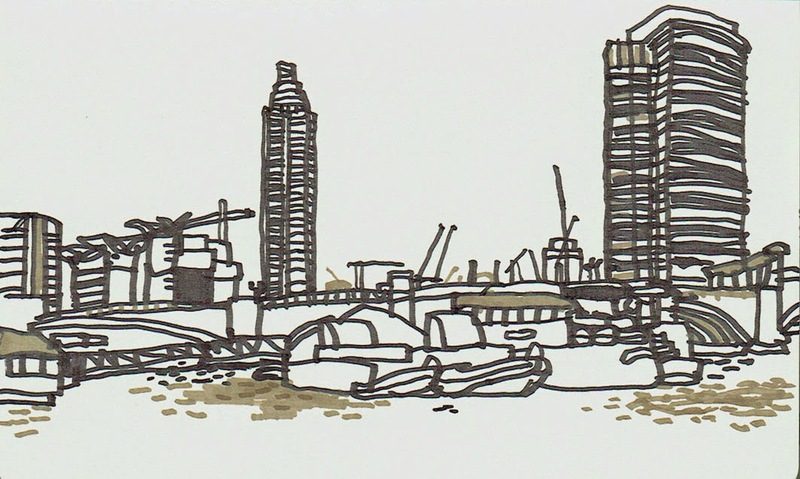 Thanks to Pete Scully for organising this sketchcrawl - and his wonderful map and stickers! Can you spot him in the photo? 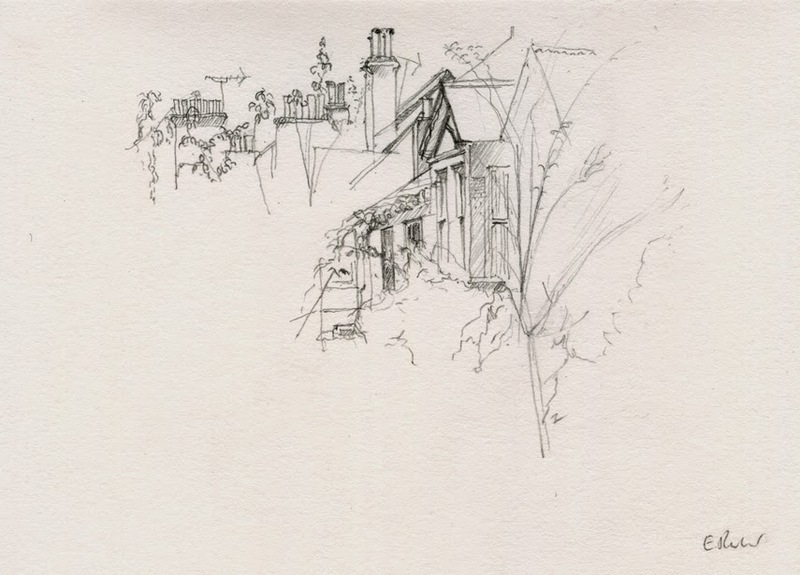 Last year I did lots of sketching of people and places along the Sydenham Artists Trail which is run as part of the Sydenham Arts Festival and showcases many talented artists and crafts people living in this part of south east London. So it was very exciting to be asked this year if I’d like to be an ‘Artist in residence’ at one of the venues. 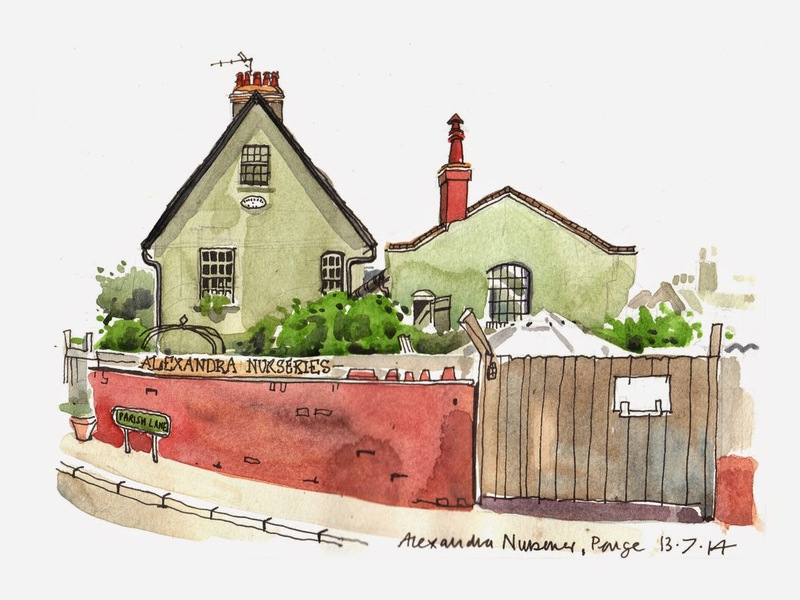 The venue was the Alexandra Nurseries, a small garden centre very close to where I live and somewhere I knew would provide lots of material for sketches. It’s an unashamedly pretty place where flowers and plants are packed in and is very popular as a place to stop for coffee and cake even if you have no interest in gardening. The building used to be the Estate House for the nearby Alexandra Cottages which were built between 1866 -88. 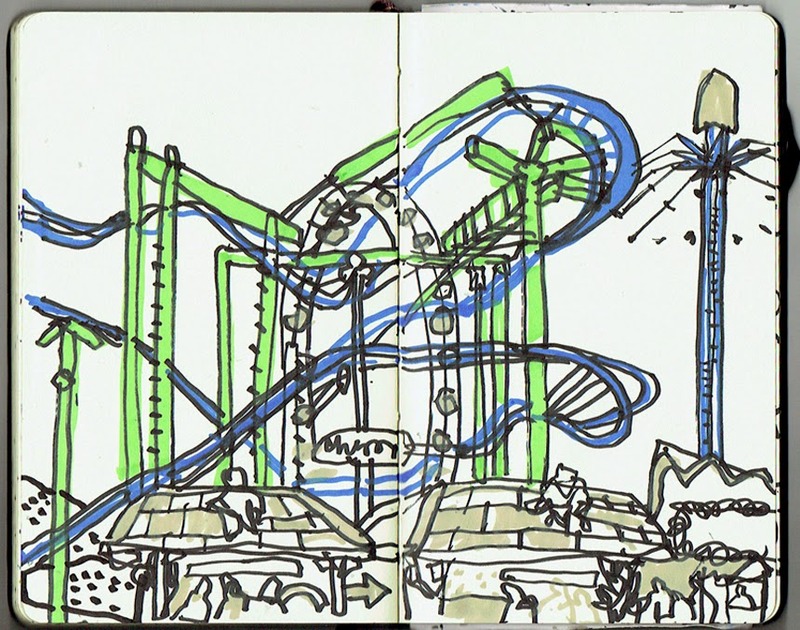 The drawings here took about 14 hours spread over two sunny July weekends. 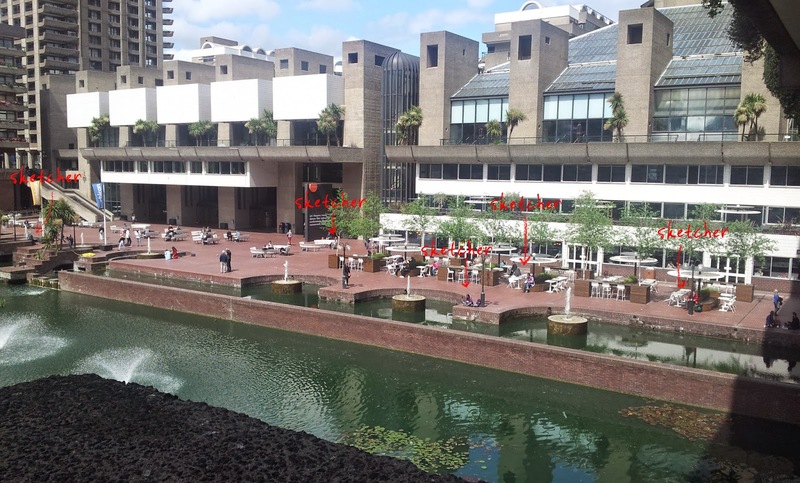 Sketchers of London! I hope you are well. 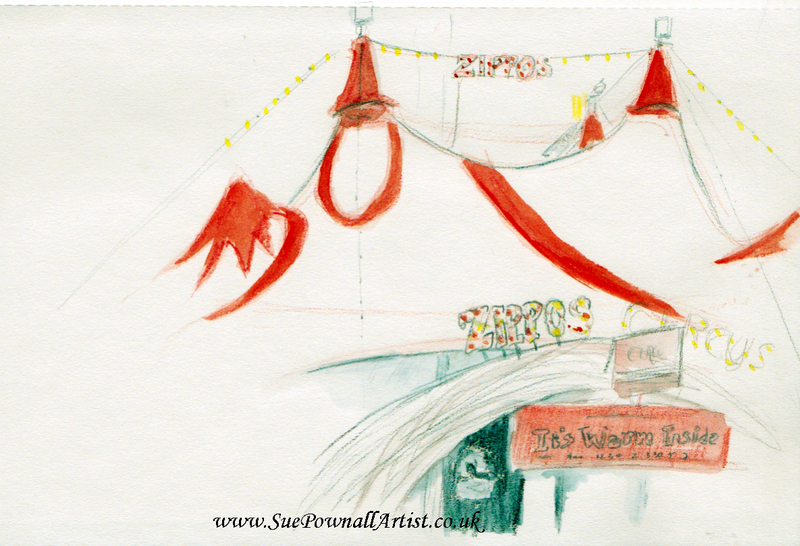 I would like to invite you to join me for another 'themed' sketchcrawl on Saturday, August 2nd. 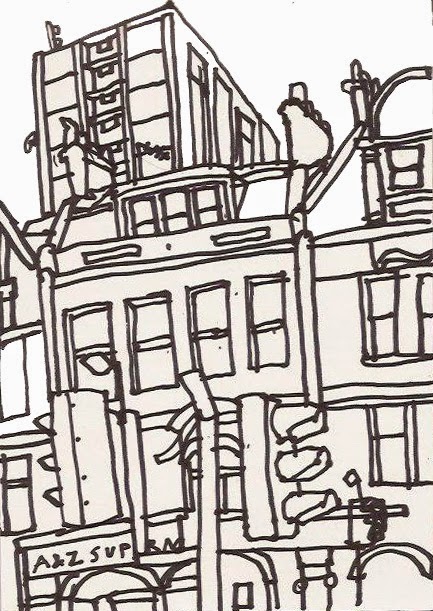 I really enjoyed last years 'crawl around the Whitechapel of Jack the Ripper, and this year I really wanted to indulge my life-long love of the London of Sir Christopher Wren, the late seventeenth century architect and scientist, by seeing how much of his City I could sketch in a day, and I invite you to do the same. We will start at 10:30am at the base of The Monument just off King William St (the nearest tube is Monument), and from there we will sketch solo or in groups, as you prefer, taking in as many of the great Wren’s buildings as we can fit on our pages, before reconvening by the steps of St. Paul’s Cathedral, Wren’s masterpiece, at 4pm, to look at each others’ sketchbooks. From there you can have a quick pint at the Old Bell on Fleet Street, the only pub built by Wren on our ‘crawl. 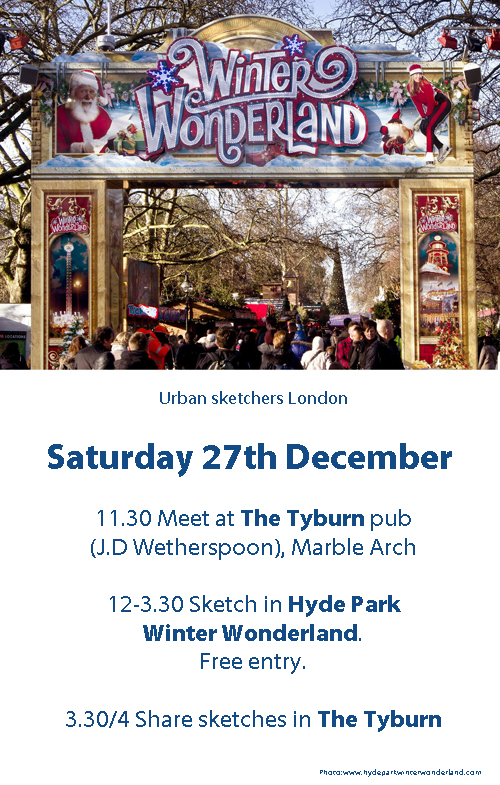 As always this sketchcrawl is free and open to anybody with an interest in urban sketching, artists of all levels and ages are welcome. All you need is something to draw with and something to draw on (oh and maybe a snack). 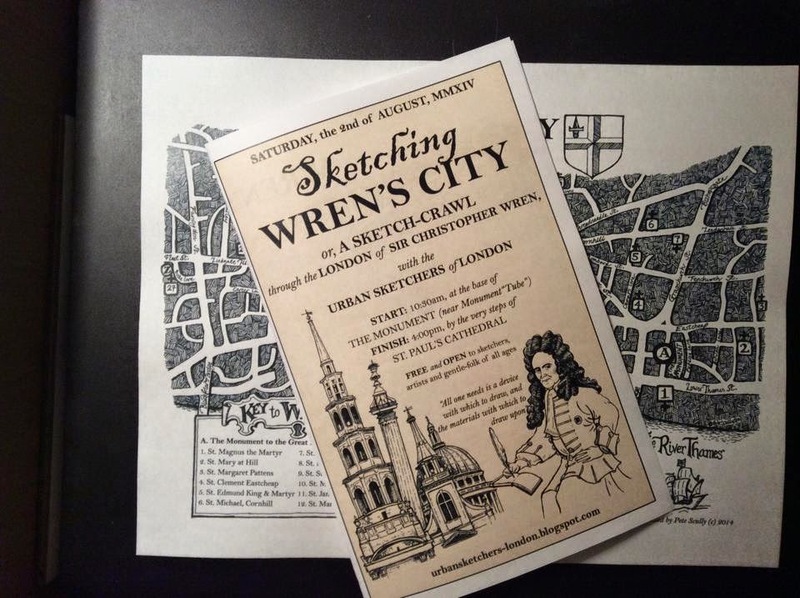 I will again be providing hand-drawn maps with a handy guide to the Wren church buildings for you to choose your own route. I hope to see you there! 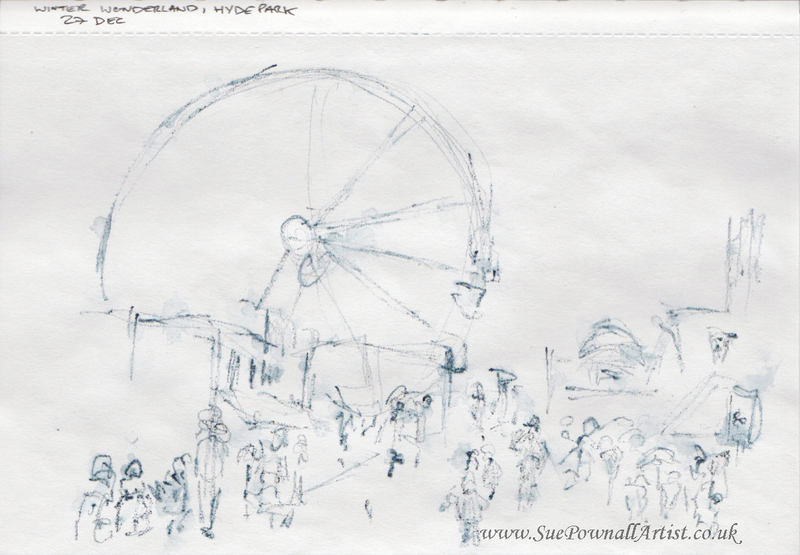 Let me introduce myself on this my first post for USk London. 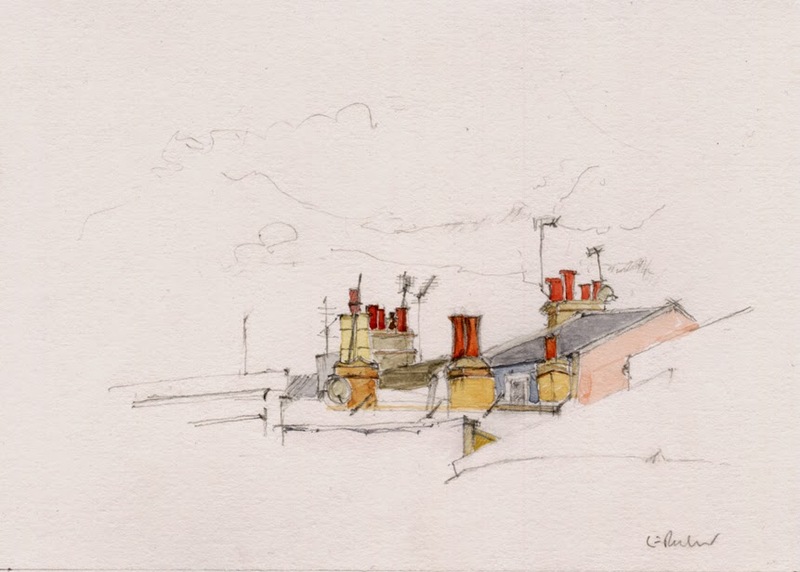 I am Isabel Carmona, architect and artist (watercolour and printmaking) and live in Newbury now although I spent 6 years in London pre 2002 and know it well. I am also part of USk Spain, helped as interpreter at last year's USk Simposioum in Barcelona and have recently organised the Oxford Workshop with Swasky and Miguel Herranz. Last Saturday 12th July, we spent a great day at Portobello Rd a large group of us as part of the 44th Worldwide Skerchcrawl, an event that occurs every four months. 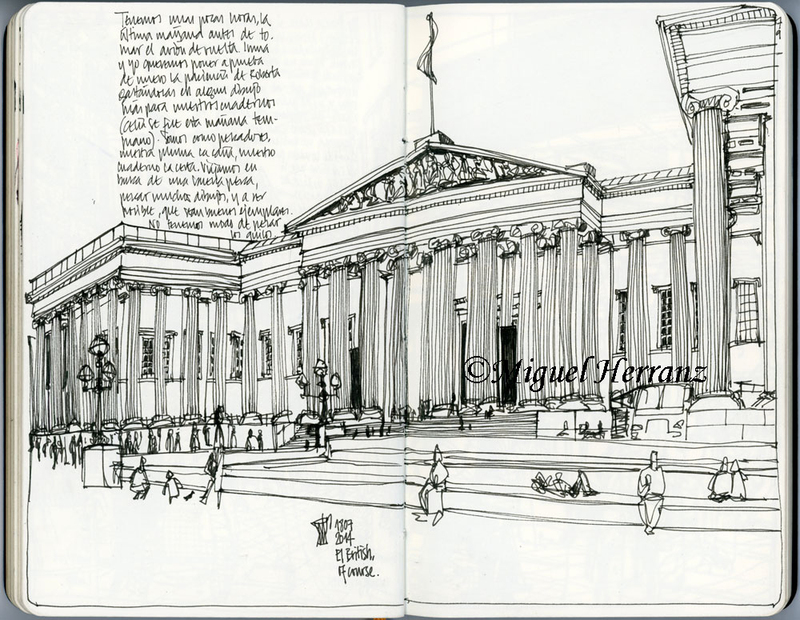 Special thanks to the group of Urban Sketchers Spain and Oxford that came following on from the Oxford Workshop. 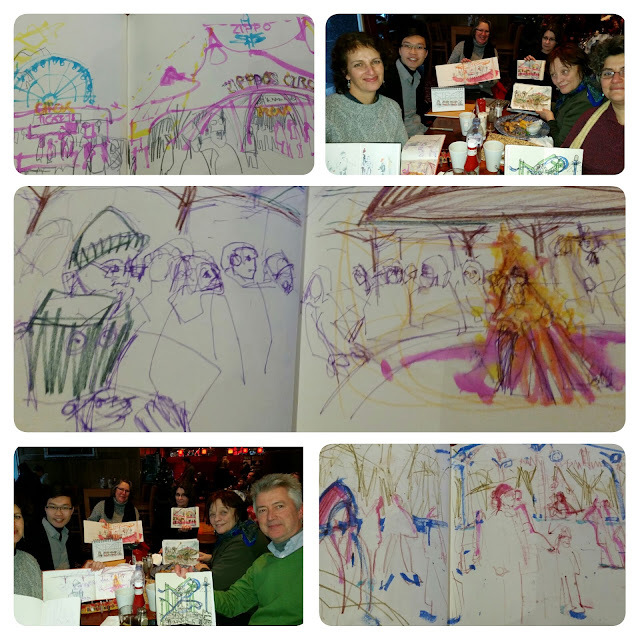 The end of the day at The Castle saw at least 30 or 40 of us discussing and enjoying seeing each other's sketchbooks. 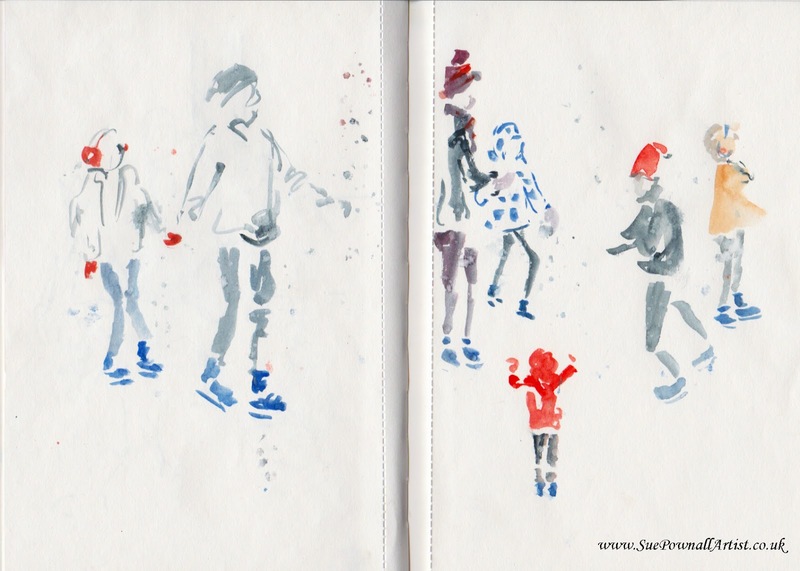 My sketches were quick as the sun was very strong and also I wanted to capture the people and the activity of the street, with street musicians and a great mix of people. I can still here the tune of the odd musician by Starbucks. A very hot afternoon down the coolest street in London. 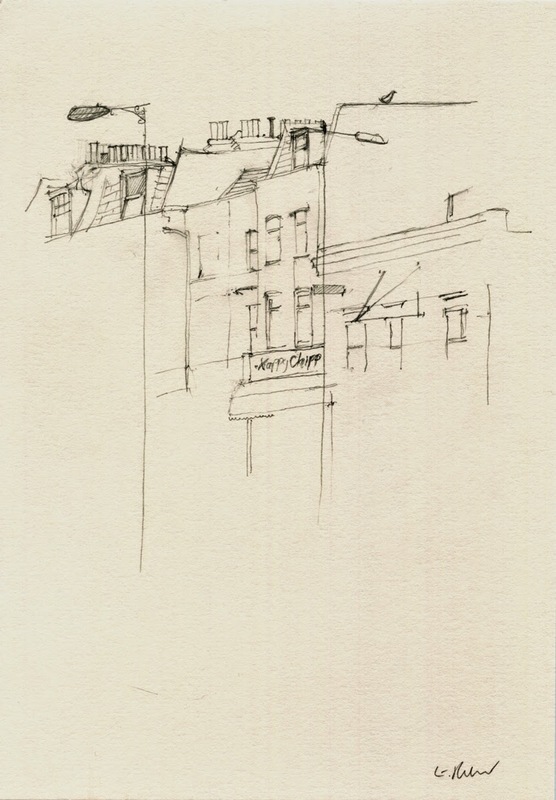 The last drawing before the obligatory drink in the pub opposite. 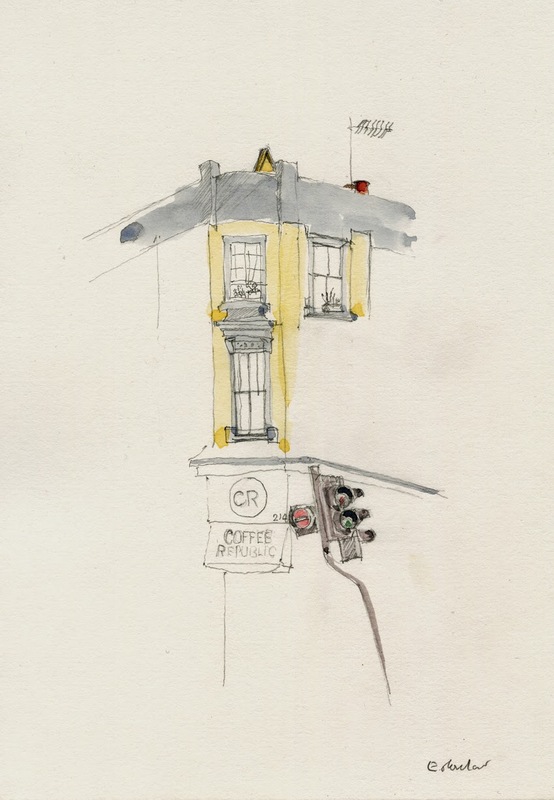 I think the traffic lights would have been better off with a coffee. 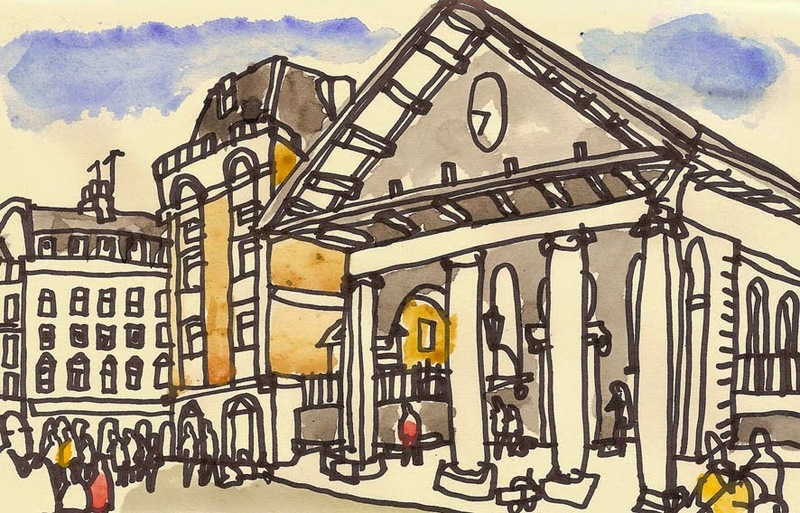 There's a London sketchcrawl this weekend on Saturday 12 July 2014 organised by Urban Sketchers who are running this week's Oxford workshop. 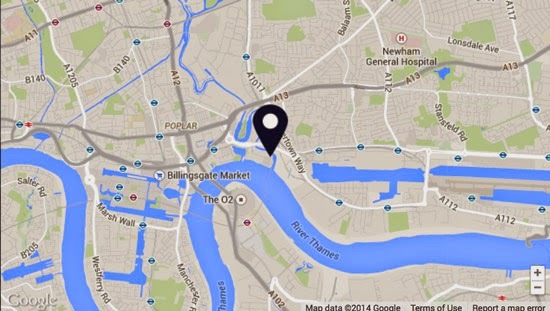 The plan is to meet at around 11am at Charlie's Portobello Road cafe, at number 58, and finish at the Castle pub (number 225) at around 4pm. 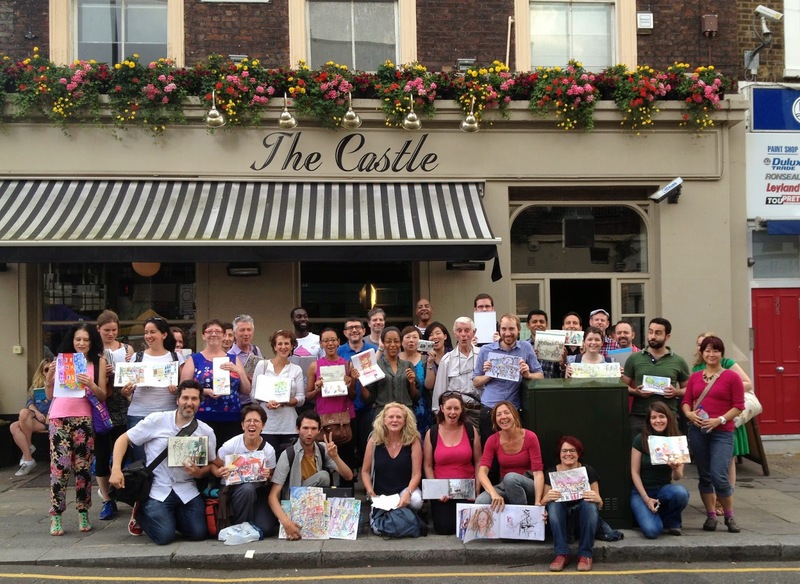 It's a great opportunity to meet Urban Sketchers both from London and internationally. 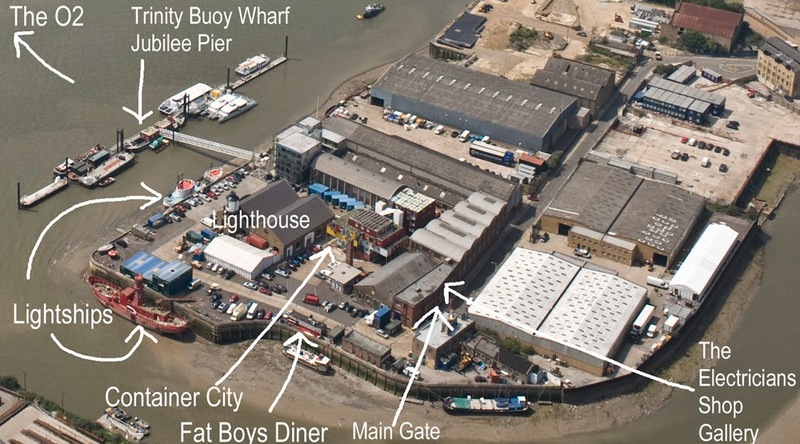 There's more information about the sketchcrawl here, and a plan of the route here. The weather forecast is looking good for Saturday, so we hope to see you there. 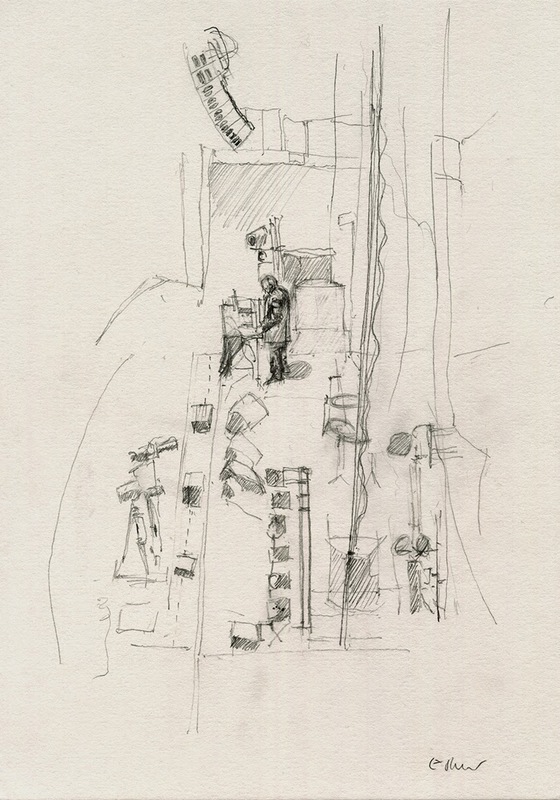 Note: Saturday 12 July is also the new closing date of the London Urban Sketchers show at Timberyard Old Street. 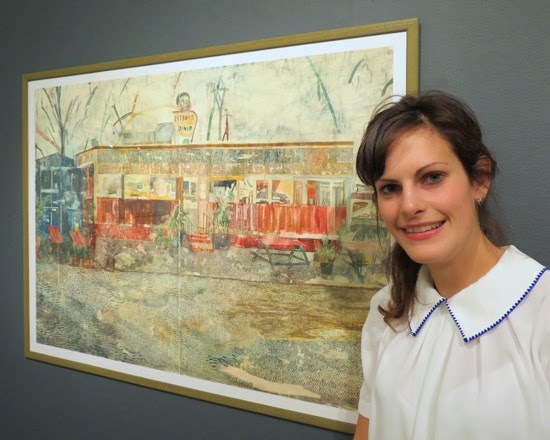 Last chance to visit! A little view of everyday life, well on a Thursday and Friday morning at any rate, while waiting for a W14. These are evening shadows though, as I finished it around 8.30 pm. 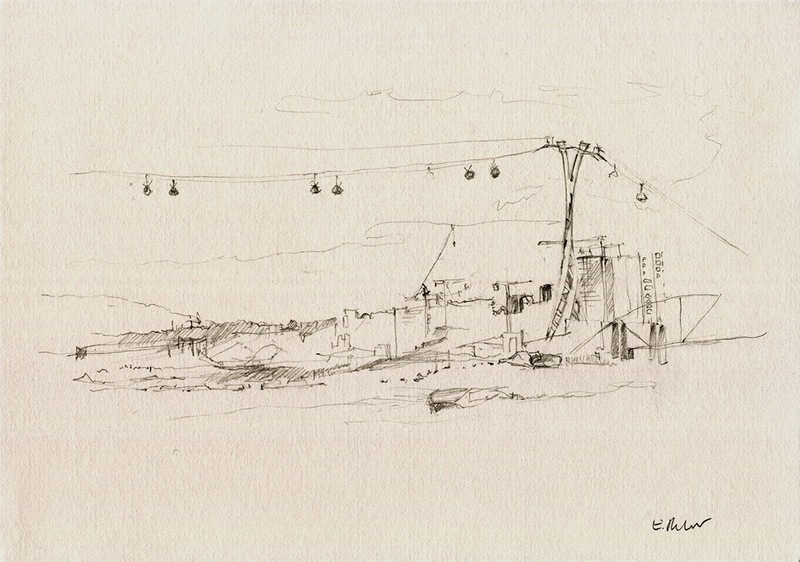 I took part in the Ilustrators’ Fair in Granary Square, Kings Cross at the weekend. It was organised by the ‘House of Illustration’ which opens there on July 2nd. 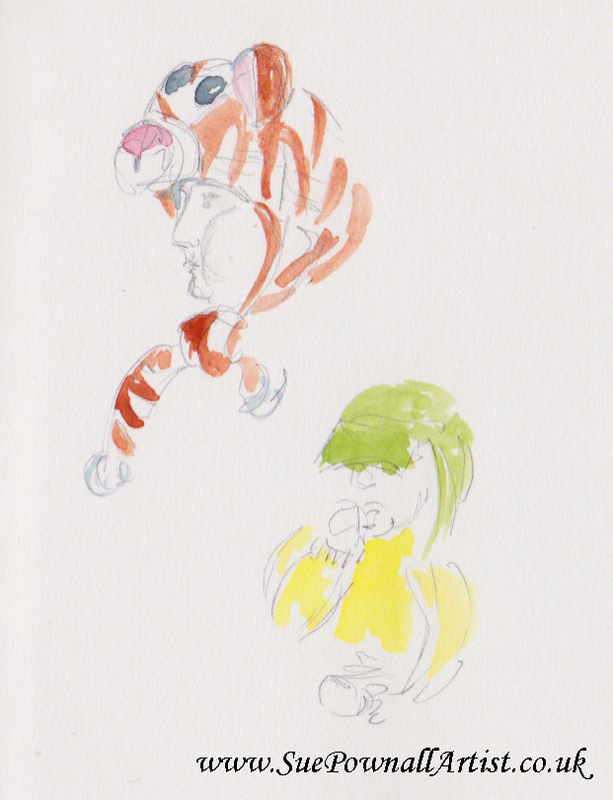 Of course as well as chatting to other illustrators, it was a great opportunity to sketch! 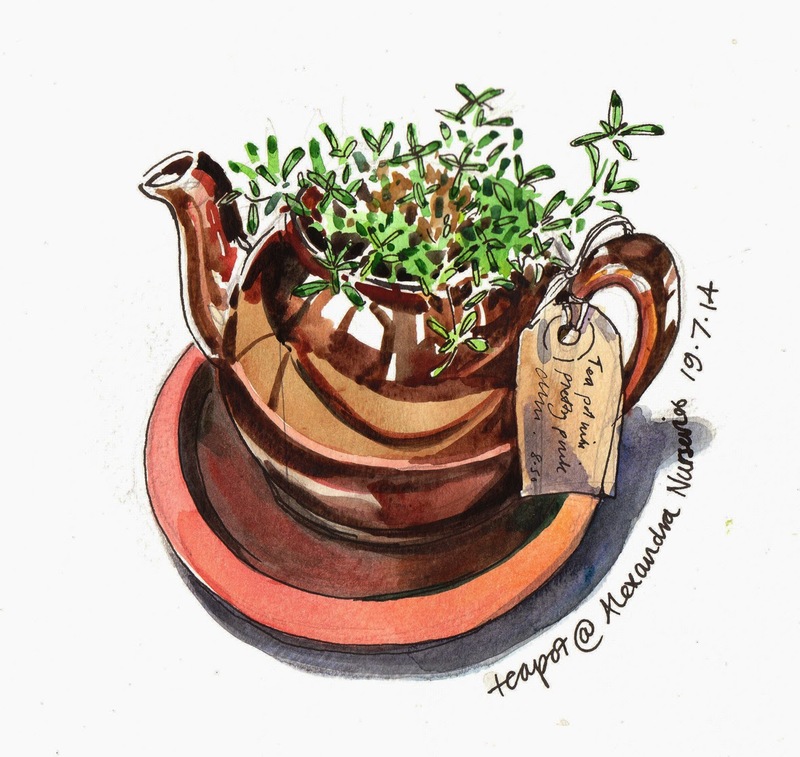 there are a couple of sketchcrawls/group drawing sessions both minor and major happening in the next few weeks - please feel free to come along to any or all of them! 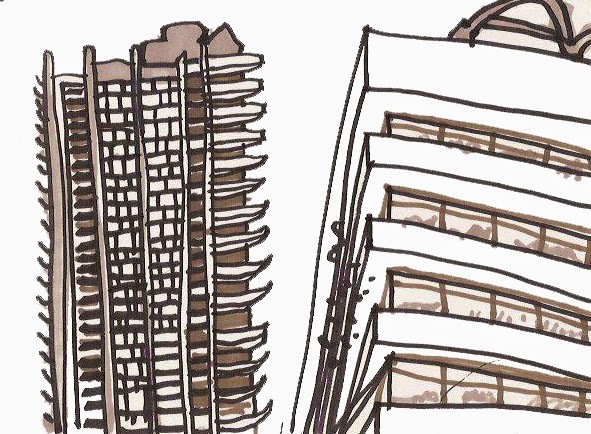 In conjunction with the Drawing London on Location Group we'll be milling around the area making sketches of this small and vibrant community festival, and encouraging people to display their sketchbooks at our stall. 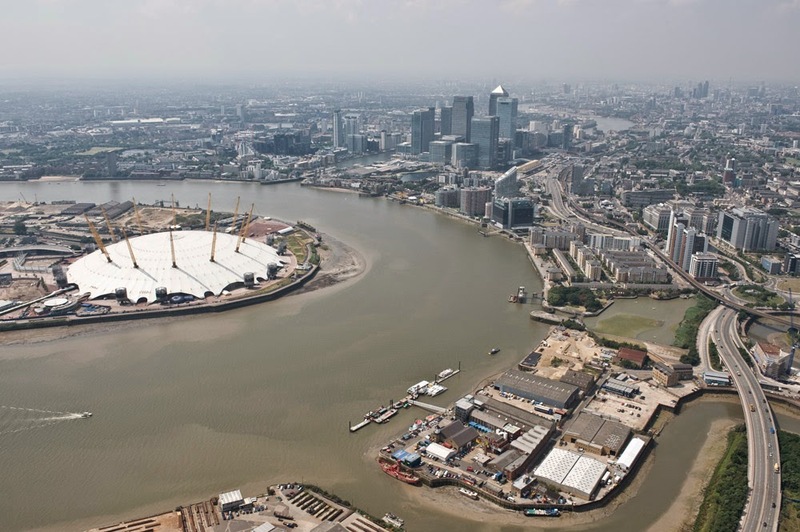 If you do want to try meeting up with our correspondents, Lis Watkins will be at the Fan Park not far from the finish line, in Green Park, central London for most of the afternoon, and Evelyn Rowland will be covering the Waterworks Roundabout in Waltham Forest around 2pm, whilst Katherine Tyrrell will be in the Westfield/Stratford area. Leave a comment or email the general email address for their contact details. 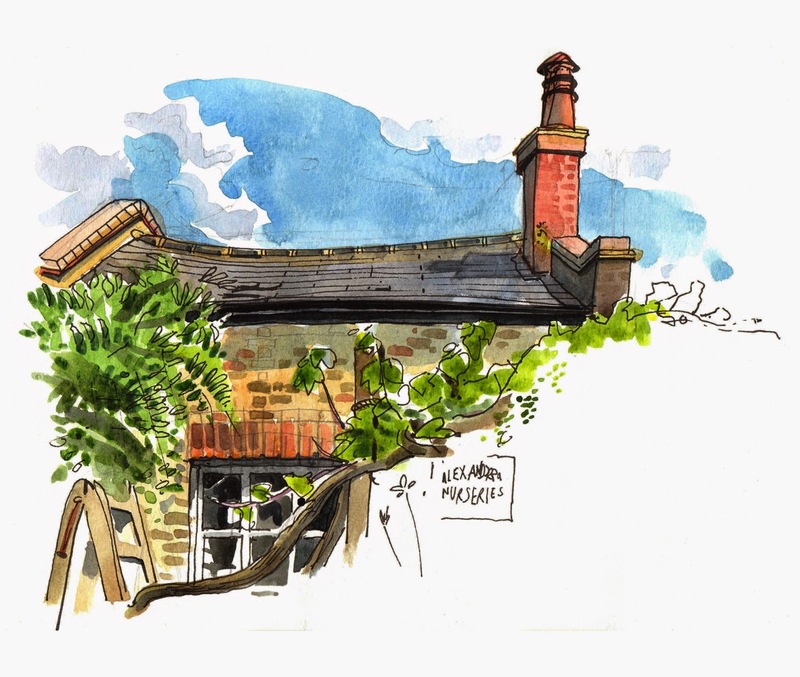 In conjunction with both the USK Oxford Workshop and the Drawing London on Location meetup.com group, we hope this will be a big one! 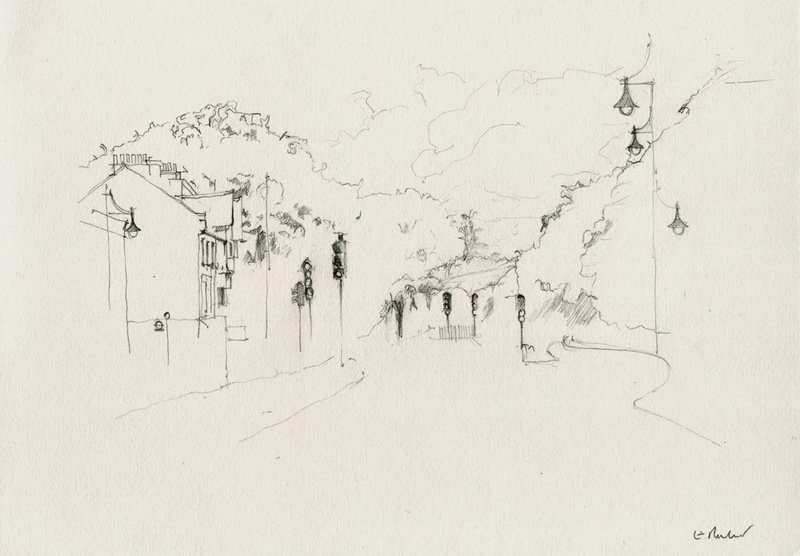 Join us in the Notting Hill area for some outdoor summer sketching! Adults and children welcome - get your drawings tweeted! 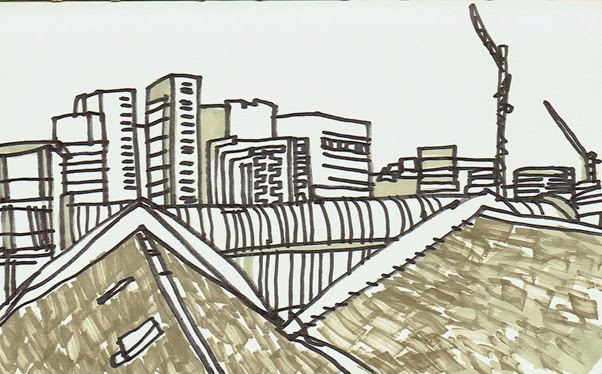 Our sketchcrawl from Timberyard Old Street towards Shoreditch was a triumph of meteorological optimism on 24 May: the rain held off (occasionally) and using the Barbican Centre as a giant umbrella over lunchtime saved us getting too sodden. It was great to see familiar and new faces, and to see the drawings people have posted on the Flickr site. Thanks to Nathan, once more, for his organisational feats. 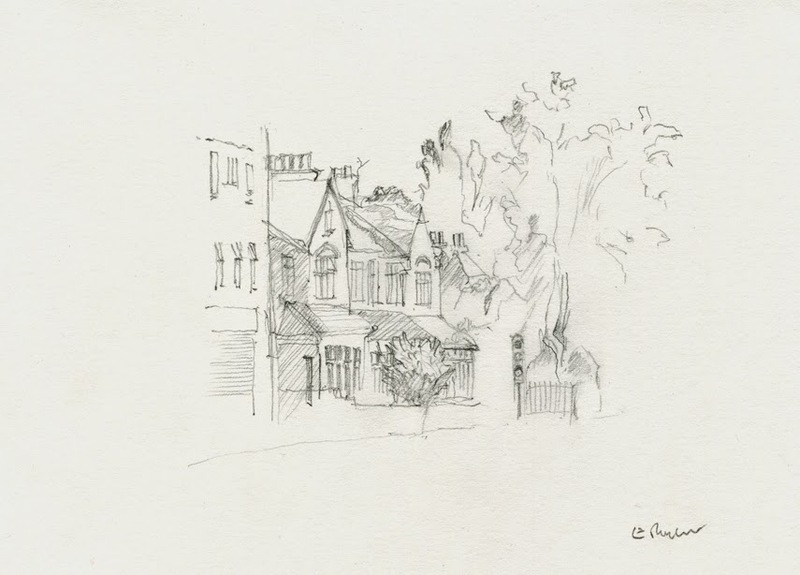 I'll be at the Stoke Newington Literary Festival on Sunday 8 June from 12 noon with copies of Sketch Your World for an informal, free, drop-in and drop-out drawing event in our corner of north London. There's more about it here. 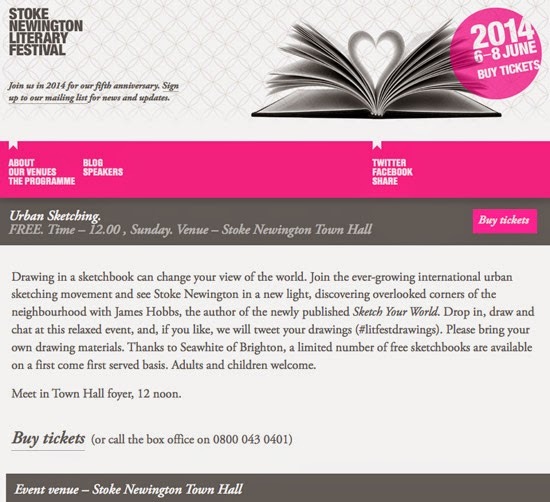 No tickets required, and there are free sketchbooks courtesy of Seawhites while stocks last. I'll be glad to see you there.